Houston Texans defensive star J.J. Watt’s foundation is raising funds for Houston Flood relief. Their campaign on YouCaring.com has already raised over $16M. The mission of the TGCR VOAD is to provide a forum where local voluntary organizations active in disaster can practice cooperation, communication, coordination, and collaboration. 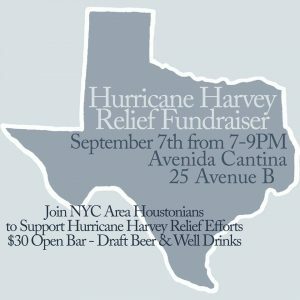 To our fellow homesick #Texans: Stand by as we finalize plans for a fundraiser to benefit those affected by #HurricaneHarvey in #NYC & #DC! Meet up in the bar area, eat and drink for a great cause. They will be selling raffle tickets. 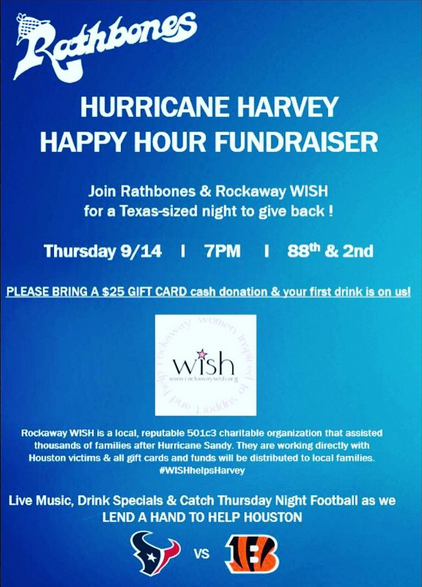 Any monetary donations will be accepted and all proceeds from the raffle tickets and 50% of proceeds from multiple menu items, including beverages will go directly to the Houston Food Bank and the Texas Diaper Bank. $5 raffle tickets to win various gift cards donated from other local businesses will be available for purchase all day Thursday. 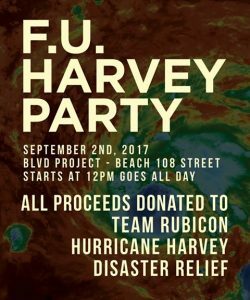 Drink a “Red Cross” cocktail this weekend at 3 waterfront bars and they will donate 100% of the revenue to The Red Cross to support Harvey recovery efforts. Available all weekend. The Red Cross: Bermuda rum, ginger, lime, orange, Angostura bitters. Oyster bar aboard the historic wooden schooner, Sherman Zwicker, moored at Pier 25 in Hudson River Park. Bar on a 1924 sailboat, “Pilot”, docked at the end of Pier 6 in Brooklyn Bridge Park. Get a free pint of Smuttynose Pinniped Vienna Lager for every $10 donation. $30 donation includes all you can drink drafts and wells 7-9pm. 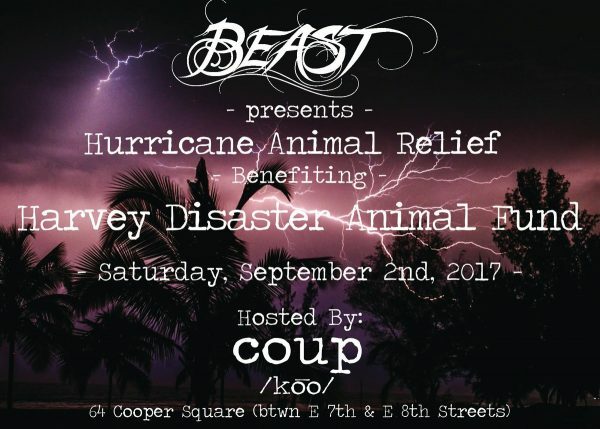 All proceeds will go to Harvey Relief (Red Cross or Hurricane Harvey Relief Fund, your choice). 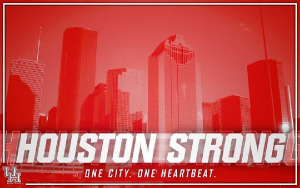 The Merchant Hospitality Group is donating 100% the proceeds of their specialy ‘HOPE AFTER THE STORM’ cocktail to the Red Cross. authentic English pub in the Financial District.